Charlotte City Councilwoman LaWana Mayfield said she's sorry for a controversial Facebook post linking to an article supporting a 9/11 conspiracy theory, saying "I apologize for the hurt and pain that was created" by the post. 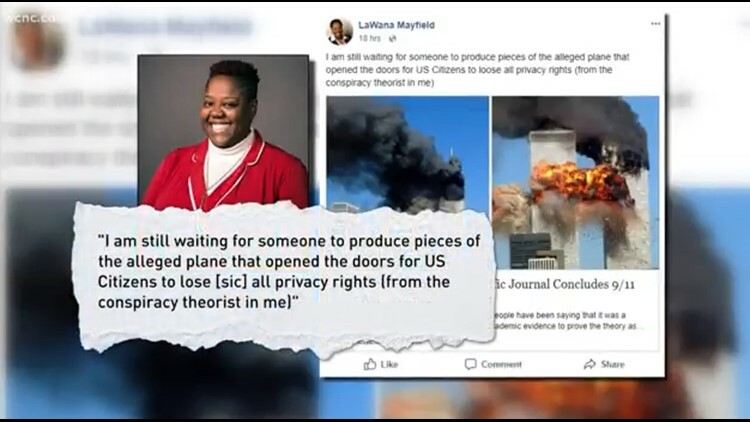 CHARLOTTE, N.C. – Charlotte City Councilwoman LaWana Mayfield said she’s sorry for a controversial Facebook post linking to an article supporting a 9/11 conspiracy theory. “I apologize for the hurt and pain that was created,” Mayfield said during the taping for an interview on NBC Charlotte’s FlashPOINT. Mayfield faced immediate criticism for the social media post, even sparking nationwide outrage and calls for her resignation. The post linked to an article suggesting a “controlled demolition” took down the World Trade Center’s towers instead of two hijacked commercial airplanes. "You're a disgrace to our city and our nation for promoting such conspiracy theory garbage. You need to resign now," Darrell Lucus commented. "Trying visiting the 9/11 Memorial in NYC, LaWana, before you write such total crap. There are plenty of aircraft pieces for you to look at. You should be embarrassed and ashamed," wrote Jim Brown. "Men, women and children lost their loved ones that day. This is one of our city's elected officials? As a Charlottean, I'm truly embarrassed," Terri Fish said. A petition on Change.org has garnered over 1,200 signatures calling for Mayfield's resignation. “I am still waiting for someone to produce pieces of the alleged plane that opened the doors for US Citizens to loose (sic) all privacy rights (from the conspiracy theorist in me),” Mayfield wrote. She later edited her post by removing the world alleged from the text. “I acknowledge, me typing the world alleged, that is a piece that hurt people at a level that was never my intention,” Mayfield said. She stopped short of dismissing conspiracy theories surrounding the deadly attack but acknowledged the tremendous loss of life on 9/11. Mayfield accepted responsibility for the post and said she’ll think twice about posting controversial content on social media in the future. Mayfield said she has no intention of resigning. Council member James Mitchell and mayor pro tem Julie Eiselt both declined to comment on Mayfield’s post. Another council member, Larken Egleston, in a statement to NBC Charlotte, wrote, “I respect my colleague, Ms. Mayfield, but disagree with her decision to make the post about 9/11 and the content of the post itself." To my Constituents in District 3, by now you have probably seen news articles, heard on the radio or from a neighbor comments regarding a Facebook post I “Shared” on Monday April 16. Below I want to clarify a few things. I am reaching out to you directly to provide background on the post and to share my thoughts on a much bigger conversation that We as a community of Black, White, and multiple other identities refuse to have. Let's start with the post, this is what I typed originally on a shared post titled: It's Official: European Scientific Journal Concludes 9/11 Was a Controlled Demolition"- written by Conspiracy Theories. NOW! nowhere in this statement did I speak to the many lives LOST, nor did I speak to the many who still have health issues today from this catastrophic event. I want to be abundantly clear. I am in no way invalidating the impacts felt by many from 9/11 that caused the deaths of more than 3,000 people. I mourn, as an American, and wholly believe that were it not for the brave and heroic efforts of many, more lives would have been lost. I do understand, that a post, while on my personal social media, could be taken out of context or even be misread. While I do oppose limits on privacy and may have questions about certain actions taken by our government, I do not diminish the horrific events of that day. I am a BLACK woman in America who sees daily how being Black is the only requirement to be continuously harassed, Killed in the streets, discriminated against in public places and assaulted in America. So it is interesting to me many non-people of color have taken offense and read through their own lense of bias my statement. I DO NOT FEEL ANY SAFER today in America after giving up our privacy. Go back to a 2014 blog on Huffington post and updated in December 2017 written by Peter Van Buren titled: "What We've Lost Since 9/11 or watch the Michael Moore film from 2004 titled Fahrenheit 9/11 this topic has been debated many a time by White America and beyond but that also was not the focus of my post. Personally, I am TIRED as an American, I am Tired as a Black American. I committed to YOU that I would be transparent, not lie to you and to address concerns in our community to the best of my ability. I did NOT say I would stop having my own opinions or stop being BLACK nor will I forget as James E Baldwin once said that "To be black and conscious in America is to be in a constant state of rage"
Many have shared many views, comments, and insults through the course of the past two days. I understand the passion surrounding this issue. I challenge those who delivered vitriol to be as passionate and angry with what is happening in our country. Although civil discussion is essential in any democracy, unfortunately, I saw name-calling, instant disenfranchisement and even some racial overtones of disgust. I respect your right to your thoughts, answers, and disgust in the course of this post. I did not delete it for that reason. I sincerely hope that the effort and energy put into the engagement on this post can be put toward voting, volunteering and tackling issues such as housing, safety, and small business growth. I hope that the disgust and unbelief shown towards me will be posted and shouted from the rooftops when there are issues of homelessness, poverty-stricken neighbors and violence in our City not being met with solutions by our government. My record is clear. I work hard for the citizens of District 3 and the City of Charlotte. Defining the work that I have done and continue to do by one post on my personal social media is unacceptable. One post does not make the person, it is merely a thought or question especially when that post is misrepresented. I have no intention to resign and will continue to serve the citizens that elected me to work for them.As your representative, you are all very important to me, service to this community is important to me and I do not want that overlooked. I will continue to fight against injustice and misrepresentation including for those who disagree with me. The beauty of our District is the Diversity and I believe there are communal issues we can address together and I will continue to fight for those issues as well. You can see Mayfield’s complete, unedited interview on FlashPOINT. It airs Sunday, April 22 at 11 a.m. on NBC Charlotte.